Good morning and good Monday! I hope you had a great weekend. Here are my and Anna's pictures for Friday's crazyjoy challenge word: carry. Sweet P is always carrying something in her hands. 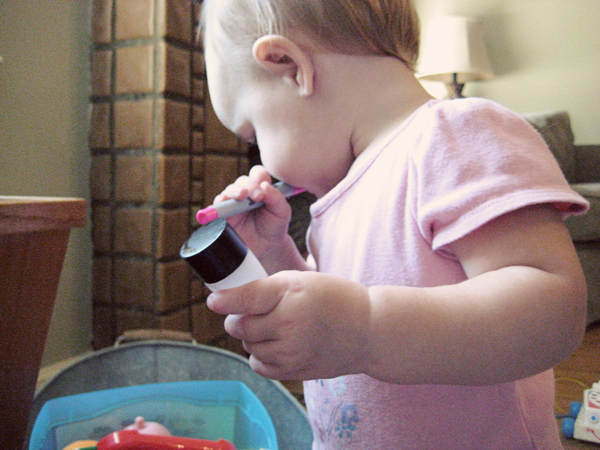 Her favorite things to carry include: sharpie pens, spoons, makeup or lotion tubes, cars and her plastic food. She usually has at least three things in her hands at all times. It cracks me up. If you joined in the challenge, link up with your blog post below and Anna will announce our favorite on Friday. I am not sure how to link...and I missed the submission deadline but here is my take on the word Carry. Thank you for sharing all that you do on your blog!